NOAA: March 2016 Was the Most Abnormally Warm Month on Record. Data released on Thursday shows that March 2016 was the warmest March since at least 1891, making it the planet's 11th consecutive month to set a global temperature milestone. Scientists are witnessing the effects of climate change. 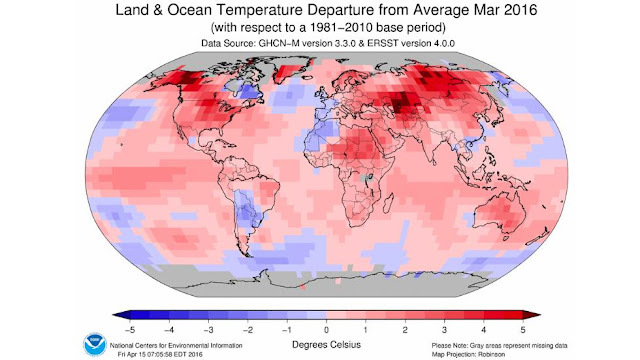 The global average surface temperature in March was 0.62 degrees Celsius, or 1.16 degrees Fahrenheit, above the 1981-2010 average. When measured against the 20th century average, the month looks even more unusual, at 1.07 degrees Celsius, or 1.9 degrees Fahrenheit, above average. March 2016 follows the most two most unusually warm months on record, which occurred in January and February. NOAA reports that March 2016 Was the Most Abnormally Warm Month on Record For the Planet, ever. 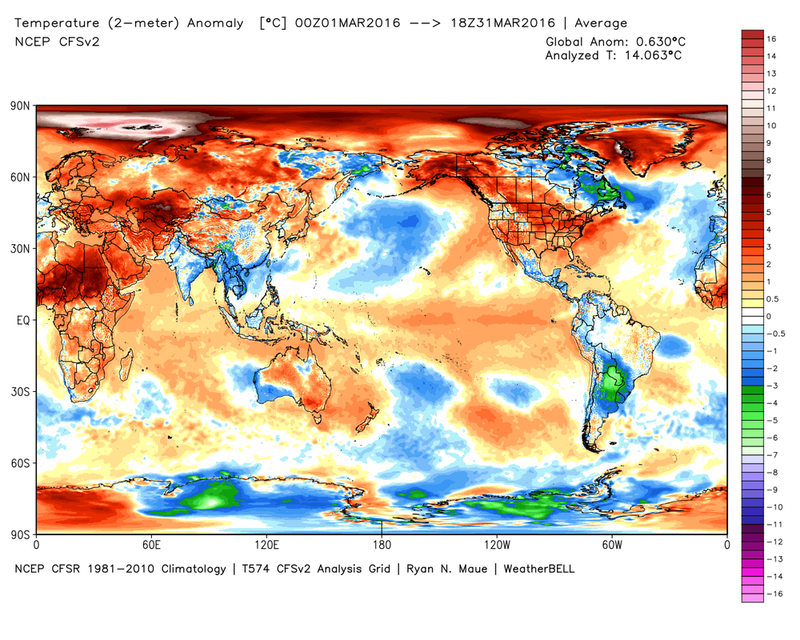 Alaska, Canada, Greenland, Central Siberia, and the Urals all experienced the most abnormally warm March, with temperatures 4 to 6 degrees Celsius above the average. In the Arctic, Greenland commenced its melt season more than one month early with temperatures skyrocketing into 60 degrees Fahrenheit in southwest Greenland and breaking records all the way to the top of the ice sheet itself, more than 10,000 feet above sea level. 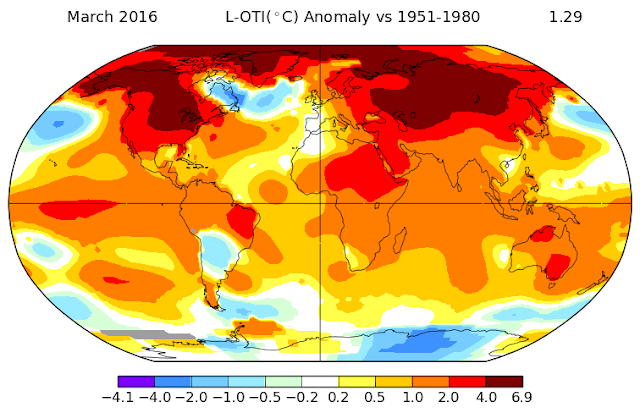 Earth's global temperatures in March 2016 were the most abnormally warm on record for any month, according to NOAA. This is the second month in a row that this remarkable feat has occurred. March 2016 is also the eleventh consecutive month in a row that the earth has recorded its warmest respective month on record. In addition to NOAA, three other agencies confirmed that this past March was the warmest on record. The Japan Meteorological Agency (JMA) calculated the global mean March 2016 temperature was 0.62 degrees Celsius (about 1.1 degrees Fahrenheit) above the March 30-year average from 1981-2010. A second analysis from NASA's Goddard Institute for Space Studies also concluded March anomalies were the highest in their period of record dating to 1880, a whopping 1.28 degrees Celsius above the 1951-1980 average period. NASA found the March 2016 anomaly crushed the previous March record by over 0.3 degrees. NOAA's global State of the Climate report released Tuesday found March's temperature over the Earth's surface was 1.22 degrees Celsius above the 20th century average, not only crushing the warmest March in the 137-year period of record set just one year prior, but also the largest temperature anomaly of any month in NOAA's database dating to 1880.